How to get your wedding guests to leave early is often a challenge, but there are 5 ways you can get them to mosey on home from the reception. These include wrapping things up subtly or in a humorous grand gesture. If you want to sabotage your own wedding party and usher those pesky stragglers out, it's time to roll out the DO NOT PLAY list! Kill the mood (and your guest's desire to stay) by bribing your entertainment to strangle the joy out of the evening with strange break-up songs, love-hating anthems, and then of course...plain old bad numbers. We're talking "Love Stinks," "You Gave Love a Bad Name," "Honky Tonk Badonkadonk," and "Who Let the Dogs Out" as the cringe-worthy croons that should lock this strategy down quickly. Extra wrap-it-up quick points for belting these groan-worthy numbers out at mega-high volume, or letting grandpa take over the decks. Brides are crazy enough as they are and one thing's for sure, nobody wants to see the night through with a crazed bride from hell on the rampage as their host! Staging a massive flip out by throwing the wedding cake across the room and smashing the flower vases on the floor should have people hot footing it to the door in double quick time. Just don't forget to let the groom in on the plan, else he'll be spending the rest of the night drowning his sorrows with his buddies. Ouch. 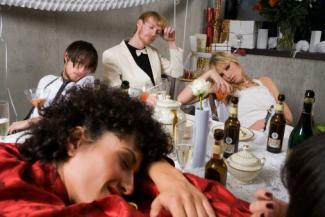 Nothing says "party over" like the bride throwing up and passing out. Even better if you can convince one of your bridesmaids to act out of her tree and be wheeled out to an alleged ambulance that is waiting just outside (because hey, that's what bridesmaids are for, right?). Because you've got to fake it 'til you make it in this world, and sending subliminal messages about going home before it's someone else's turn to lose all respect is the smart way forward when ousting guests. This one's all about timing because if you roll this strategy out too late, everyone will be having too much of a good time to notice. Be warned, this will probably involve a HUGE amount of bribery as the key here is to get someone who everybody REALLY doesn't want to see streaking to...urmmmm...streak! Yup, we're thinking a mad old, easily influenced aunt with more saggy bits than you can shake a stick at, because once your guests have that image in their head, no amount of witchcraft will be able to help resurrect this party from the dead. Let's get this straight - we're not talking any old wedding crashing here done by just anyone. We're talking about pulling out the big guns with something mega intimidating - like a bunch of big old hairy bikers. All you need to do to pull this one off, obviously, is make friends with your local crew of bikers and bribe them with endless amounts of wedding cake and Jack Daniels. Easily done. Got them to get their coats and end the first pumping? Don't feel bad, they've always got the next wedding to outstay their welcome.